November 06, 2017, 11:09 a.m. In many walks of life, from politics to sport to business, there is a noticeable emphasis on the importance of leaders and leadership. Any organisation or team, though, has a mix of leaders and followers – but what is the leader/follower make-up of Britain? 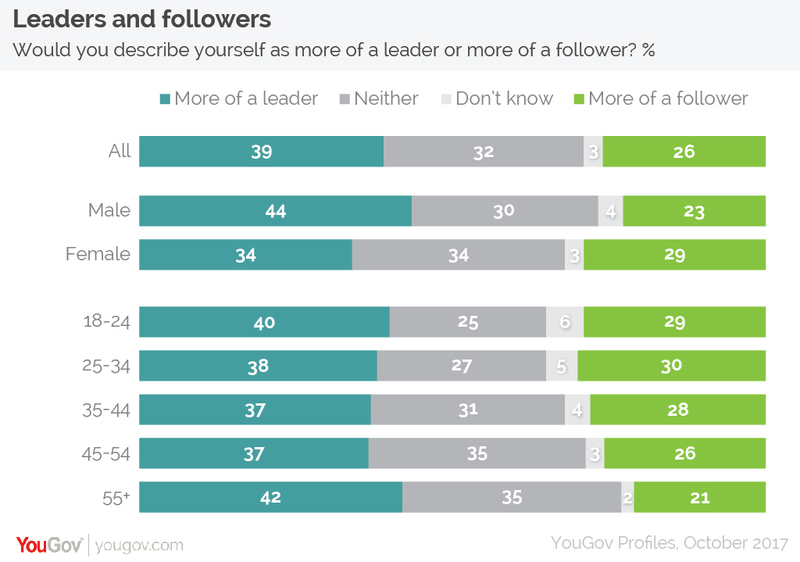 New analysis of more than 48,000 Britons using YouGov Profiles reveals that almost four in ten (39%) consider themselves to be more of a leader, while a quarter (26%) feel themselves more of a follower. About a third (32%) identify with neither, while the remaining 3% say “don’t know”. While men are more likely to identify as leaders than women, within both genders people are still more likely to consider themselves a leader than a follower. Overall, 44% of men and 34% of women consider themselves leaders, compared to 22% and 29% respectively who consider themselves followers. While across all age groups people are more likely to consider themselves as a leader than a follower, older people are statistically more likely to see themselves as leader when compared to other age groups, and likewise younger people are more likely to self-identify as a follower than their elders. Leaders tend to be more well-educated than followers and are more likely to be found in managerial, professional or supervisory roles. Followers, meanwhile, are more likely to be in clerical, sales, services and semi-skilled or unskilled work. Leaders are also more likely to be self-employed than followers. Around one in six leaders (17%) are self-employed (or were prior to retirement), compared to 8% of followers. Leaders consider themselves more willing to take risks than followers do. 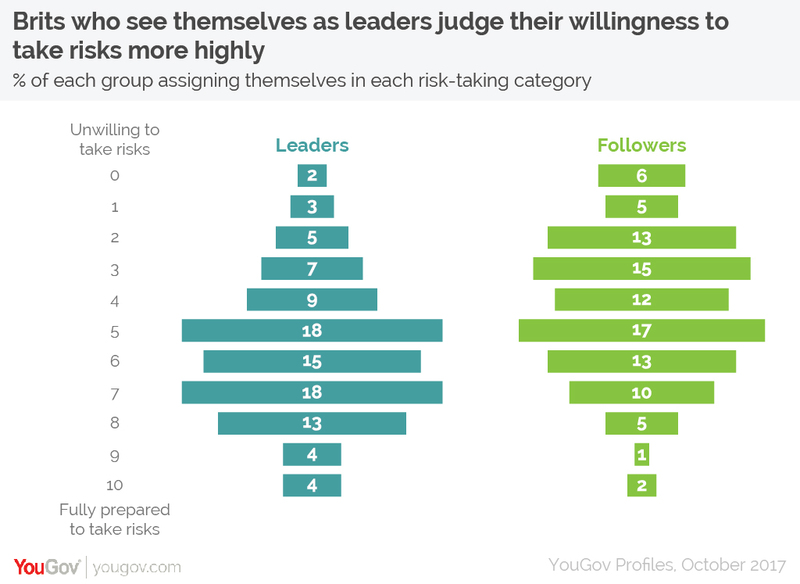 Asked to judge their willingness to take risks on a scale of 0-10, with 0 being “unwilling to take risks” and 10 being “fully prepared to take risks”, 53% of leaders rated themselves a 6-10, compared to 30% of followers. When it comes to decision-making, leaders’ heads are much more likely to rule their hearts than is the case among followers. Almost half (47%) of leaders say that their head tends to rule their heart, compared to 34% who feel it works the other way round. By contrast, followers are evenly split with 41% saying they tend to be head-over-heart and 43% heart-over-head. On lifestyle, when compared to followers, leaders are statistically most likely to say they seek out challenging situations, enjoy taking risks and like to think outside the box. By contrast, followers are statistically more likely to say they like to get input from other people when making decisions, that their idea of the perfect night out is staying at home, and that they envy the lifestyle of their friends. 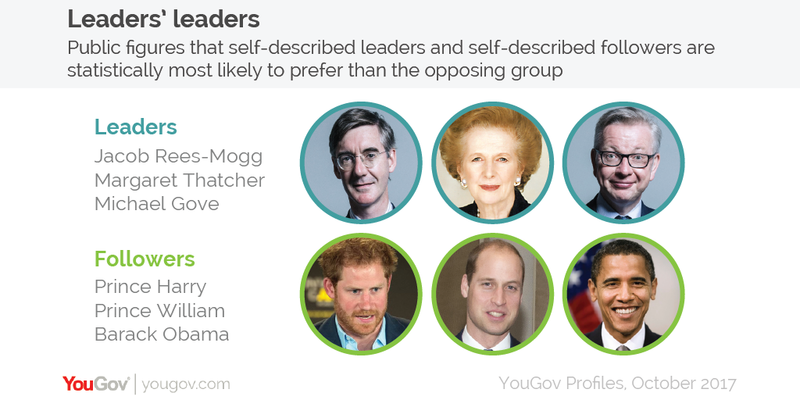 YouGov Profiles also allows us to examine the favourite real-world leaders of self-described leaders and followers. The three public figures that leaders liked statistically more than followers are Jacob Rees-Mogg, Margaret Thatcher and Michael Gove. Self-described followers, meanwhile, would most prefer to be led by Prince Harry, Prince William or Barack Obama than those who consider themselves to be leaders.